In the 1982 IDC Final at Prince Charles Park we played Ba. Ba, like Nadi, had all the supporters from home here at Prince Charles Park. We also had our supporters. The ground was filled with more than 22,000 people which is one of the biggest crowds ever at Prince Charles Park after the new embankments had been constructed. 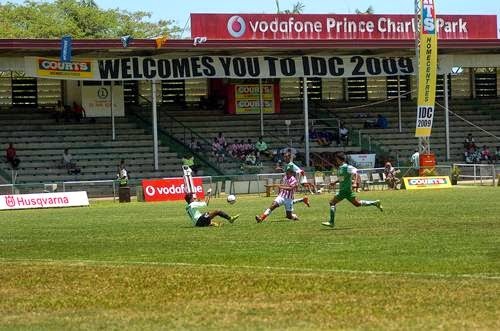 Two reasons for the decline in IDC final crowds since that time are the emigration of Indo-Fijians and the decline in interest in soccer among those who remain here. The weather that evening was very dull. It was an even competition against Ba. Playing Ba in a final is not easy as they have proved to be the Soccer Kings of Fiji. Maybe the form of our winning combination during the season enabled us to play equally as well as Ba until the final whistle. Ba was very wary of us. The game carried on until dark. The dark came in very early. Injuries too had inflicted their mark on both of the teams. I had a cut on my head which I received from a head-clash with Joe Tubuna (Ba). In the second-half Joe Tubuna was in an attacking position and there was a cross from the right side of the grandstand towards the hospital end. We were defending the hospital end. Tubuna runs in to head the ball into the goal-mouth just outside the penalty box. I had fallen back in defence and I knew that this attempt could be the end of the final since I knew Joe had a lot of ability and could do anything. The score was 0-0 and this was during the second-half. I looked around and I knew that our defence was off-guard and I was the only person around to contest the aerial battle. Somehow we both missed the ball and we bumped each other in the head. Joe was badly hurt. Just above his right eye-lid was all white-coloured and the skin dropped down over the eye. The skin was all white and the blood came later. I had a cut in my head and was lying down too on the ground about two metres away from Joe. I looked at Joe to see what had happened to him. When I looked up to look at Joe with one of my eyes I saw the white under-skin and the appearance of blood beneath it. There was a major flow of blood after this. When I saw this I was very afraid because I respected Joe as a player. I thought he would just run up and bash me up. The St John’s held Joe’s eyelid up to slow the bleeding and Joe was rushed to Nadi Hospital for stitches. Joe, after being stitched and wrapped around the head with bandages, insisted to the Ba officials that he come back and continue playing until the last whistle. The soccer officials did not allow him to continue. Joe, as I always said, had a never-say-die attitude. I was more worried when I saw him stand on the side of the field with bandages! A year later we played together in the Fiji team at the 1983 South Pacific Games (see Chapter 3). Joe Tubuna was one of my idols as I used to watch him play when I was young. Later we became the best of friends. In another injury our Goal-Keeper at the penalty shootout had to go for an injection to numb a swollen ankle. We thought that we had lost the game because Save was the only specialist Goal-Keeper. When the penalty shoot-out was in progress it was becoming darker. At the end of the shoot-out [10 kicks each] we were even again [6-6]. Savenaca Waqa, our Goal-Keeper, did a terrific job to save shots with an injured ankle. There was a commotion at the end of the shoot-out. By now Ba soccer officials were protesting about the light. They were saying that they would not continue the game. We could not do much but agree to stop the game at this point. The Ba and Nadi soccer supporters were in a crazy mood. They were both saying that their team had won. The Nadi soccer fans were teasing them by saying that Ba were the scaredy-cats who had abandoned the game. This is the first time that I learned about injections that would carry you through the game even though I did not take one. We had to go and play another game in Lautoka because Fiji Football made a ruling that we should play on a neutral ground. Nadi refused to play on neutral ground as Nadi was where the original tournament was held. In response to this our then President, Sri. V. Chetty, refused to go and play in Lautoka. Ba soccer officials agreed with Nadi officials not to turn up at Lautoka. It was a verbal agreement between the then President Sri. 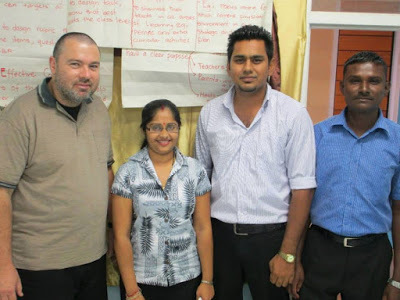 V. Chetty of Nadi and Vinod Patel of Ba (as confirmed by Bobby Tikaram, then Nadi Vice-President, in personal conversation with Henry Dyer and Kieran James, 12 June 2014). The agreement was confirmed by Sashi Mahendra Singh, the then father of Ba and Fiji football (as recalled by Bobby Tikaram, in personal interview with Kieran James and Henry Dyer, 14 August 2014). At the eleventh hour Ba turned up at the match and walked on to the field. We were there expecting the game not to happen. We were surprised to see Ba walk on to the field. We were there in our normal street-clothes walking around the park. We were shocked at what happened. Ba broke their verbal agreement. That was a matter for the officials. We players are still close until today. Now I’m able to say I think we should have played the final to sort it out and to provide a proper conclusion for the fans. The players were ready to play them anywhere. We were not unhappy with the management. We had to go with the flow so it’s a tussle. The Nadi soccer fans were very upset. We could tell when we mingled with the supporters. They would be complaining about this at every opportunity and we had to answer them. These events made the rivalry between Nadi and Ba even stronger. 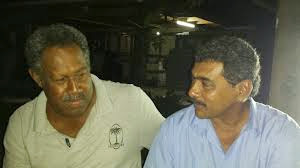 Emasi Koroi ("Bacardi") (left) and Peter Dean. Both played for Nadi in the 1982 IDC Final against Ba. Today Peter Dean drives a public bus on the Nadi-Lautoka route. I watched that game as a kid. During the penalty shoot-out, Ba's Julie Sami had his spot-kick stopped by Savenaca Waqa, but in typical Ba-fashion Sami maabaged to sweet-talk the refree into ordering a re-kick which he duly converted.Ba have always been champions of swaying FFA officials and nothing has ever changed in that regard. it was a memorable story.tks dyer.